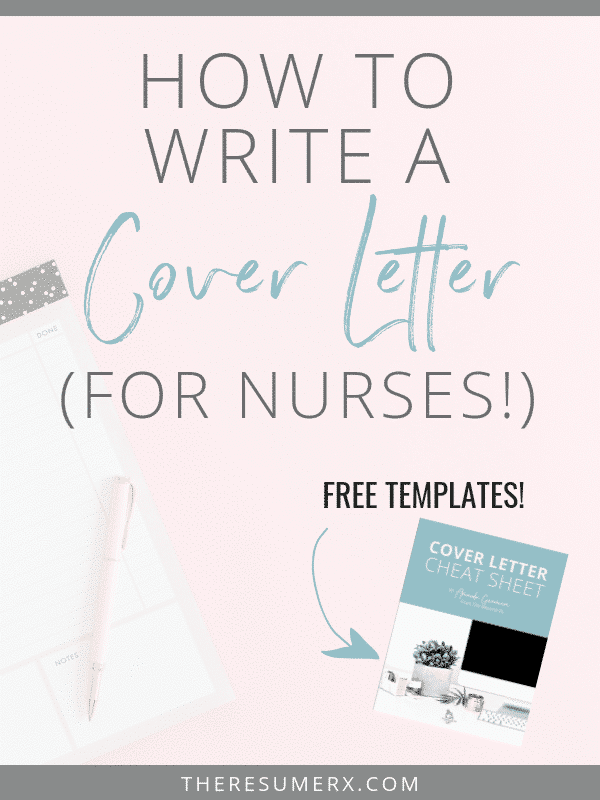 Nurse Cover Letter Anatomy: A step-by-step approach with examples! Do you know what I get asked about almost as often as résumés? Everyone knows they need a résumé, and most people can throw one together with a little bit of guidance (and maybe a killer template). But it’s the cover letter that I see leaving people paralyzed. What is there to say that’s not on my résumé? The good news is, I’m here to tell you that not only can cover letters be the #1 reason why you get called for an interview, but you also can stand out and increase your odds if you include some of my highly recommended elements! 1. 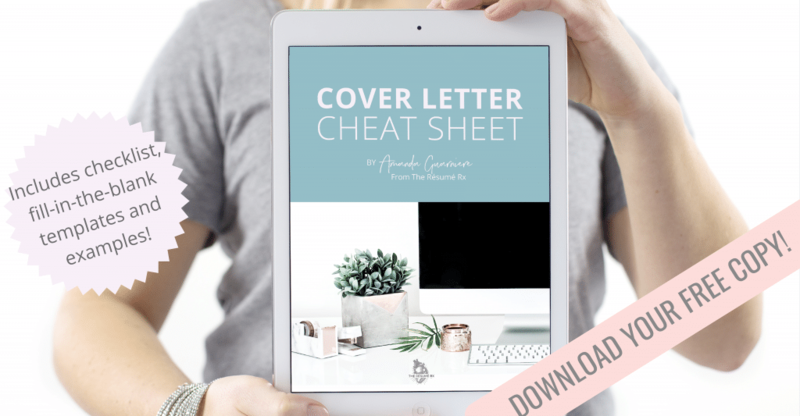 The first way to make a huge impact with your cover letter is to elevate the formatting and style. I don’t recommend going overboard with colors or super fancy fonts, but making your name big and adding a sub-heading with your contact info is a nice way to start. You may have heard me talk before about “branding,” which is essentially using similar formatting for all your job search documents in order to appear consistent, detail oriented, and memorable. An easy way to do this is to use a similar template for your cover letter and résumé. You can do this on your own by changing your fonts in Microsoft Word (or whatever you use) and making your headings appear similar on both your résumé and cover letter. If you want an easy solution that does this for you, all my digital download résumé templates include matching résumés, cover letters, and reference lists for just $14.99. If you’ve heard about my eBook, To Whom it May Concern, you know that I came up with the title out of irony. Finding out the name of who will be reviewing your résumé may be easier than you think. Take 10 minutes, do some searching around the organization’s website, and try and figure out who the HR manager or recruitment individual is. Applying to a larger hospital or organization? 3. The next thing I want you to consider putting into your cover letter is some PASSION! The best way to do this is with a personal story. It does not have to be long, and in fact it can be just one sentence. But inserting something that shows are are human can do wonders for your “on paper” impression. Check out this one-liner from Carly’s cover letter. Ever since I observed the compassionate care my sister received during her battle with leukemia, I have dreamt of becoming a pediatric oncology nurse. Doesn’t this leave you wanting to know about her and her personal motivation to pursue this position? You can bet that when she interviews for the position and tells this entire story, the hiring manager is going to remember that hook that she included in her cover letter. 4. Showcase achievements, not responsibilities. It’s a great idea to keep track of any sort of metrics or feedback you get in school or in your job(s). You can ask your manager for this type of information or keep track of it yourself. If you’re a new graduate, you can include your average clinical grade, or the percentage of positive preceptor evaluations you received. If you’re an experienced bedside nurse, you can include your pain reassessment times or discharge numbers. If you’re a nurse practitioner, consider including your productivity average, no-show rate, or patient satisfaction scores. Somewhere towards the middle or end of your cover letter, you should paint a picture of how you, the applicant, will seamlessly fit into the vacancy. You want your hiring manager to be able to picture you in the position. A way to do this is to outline exactly how you feel your experience has prepared you for this particular position. This type of writing can take a bit of finesse, and usually involves a combination of brainstorming and combing through the job description of the job you’re applying to. If a position is looking for someone who thrives in a fast-paced environment, showcase how you have done that before. If a position involves working with a difficult patient population, highlight how you connect with your patients and are acknowledged for your customer service. This may be the toughest part of your cover letter to write, so don’t neglect it and give it the time it deserves. I am a recent graduate of St. Joseph’s Nursing School, where I consistently achieved a >3.8 GPA. In addition to making the Dean’s List every semester, I also mentored my classmates as a peer tutor. I thrived in all my clinical settings, where I received >95% positive preceptor evaluations in all rotations. While I may be a new graduate, I am responsive to feedback and easily trainable. I am comfortable in new settings and know when to ask questions of my mentors. 6. As you get ready to conclude your cover letter, it’s time to seal the deal. Up until now, you’ve showed your humanity with a personal story or “hook,” highlighted your achievements, and showed how you will seamlessly fit in to the role you’re applying for. You need to let them know again that you are interested in the position, and the way to do this is to invite the reader to learn more about you. The secret here is rather than saying something generic such as “please contact me with any questions,” or “I look forward to hearing from you about this great opportunity,” you are going to seal the deal by opening the door to a conversation. Check out how Carly ends her cover letter by saying she looks forward to discussing how she and the future employer can work together to improve care outcomes for pediatric cancer patients. I am confident that I will bring compassionate, quality care to the pediatric oncology patients on 6-East. I’d be honored at the opportunity to discuss with you further how we can work together to advocate for and nurture this special patient population. Are you picking up your phone to call her right now? Because she has shown you (the hiring manager), oh-so-eloquently, that she is a team-player with the same goals as you. There are many professional (and not stuffy) ways to sign off your cover letter, and make sure that you do so. Okay, I’ve included this one as a bonus, but it comes with a disclaimer. But only if it’s done really well. Think of the P.S. as a cliff hanger. That last scene of a Netflix show that makes it so easy to click next and watch the next episode (no judgement here!). If you have something else to say that is so awesome that it must be explained in person, put it in the P.S. Maybe you started a non-profit organization, or coordinated a mission trip to a developing country, or have an in-the-works research project that’s showing amazing outcomes. P.S. I look forward to telling you more about how I coordinated a mission trip that resulted in the vaccination of 341 children. I’m serious here. It has to be good stuff. So…are you feeling excited yet about writing your cover letter?? I hope this has given you a good starting point. If you want to take things to the next level, and seriously follow a fool-proof system to writing a cover letter, I’ve done the work for you! 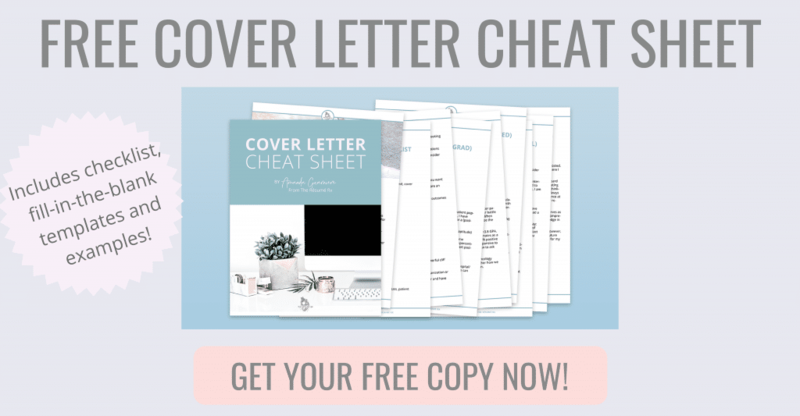 Click below to download my FREE Cover Letter Cheat Sheet, which contains a checklist of essential components, 3 fill-in-the-blank cover letter templates as well as examples for new grads, experienced bedside nurses, and advanced practice providers! Amanda is a twin mom by day, ER nurse practitioner by night, and the founder of The Résumé Rx. She’s committed to helping medical professionals discover and land their dream jobs through beautiful résumés and guided career exploration. How Long Should You Stay in a Nursing Job?